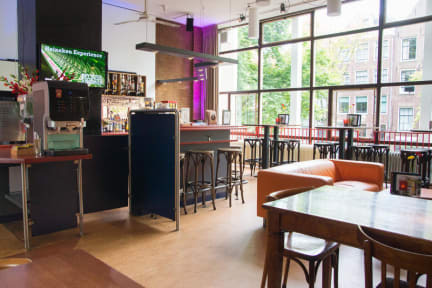 Stayokay Amsterdam Stadsdoelen is in a quiet street overlooking the canal, near the Red Light District, Dam Square and Centraal Station. The breakfast at this hostel is highly praised, and Hostelworld guests have said they would recommend this hostel because of the staff, who are 'always willing to answer questions, give suggestions and [create] an atmosphere where people just enjoy themselves'. 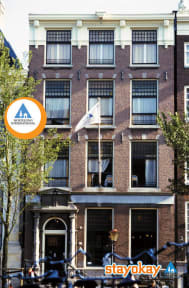 We like that this hostel offers discounted tickets to several popular tourist sites around Amsterdam. Breakfast in our hostel? Try our Grab&Go: you can order 3 items for € 5,50. How about a cheese sandwich, a fresh smoothie and a cappuccino? Would you prefer something else? Check the menu in our hostel. I think what puts us ahead of the rest is all about location, location, location - we're in a monumental canal house on one of the canals near the Red Light District. You'll be right in the centre but it's still quiet enough to have a good night's sleep.